When the day finally comes for you to get your braces removed at Milestone Orthodontics in West Orange, NJ, the next step is a retainer! Retainers are used to hold the teeth in their new positions, and are either removable or permanent. Removable retainers are fairly easy to use and care for, and they make brushing and flossing easier and more comfortable. The retainer is placed in at night, worn while you sleep and taken out in the morning. Retainer schedules may vary from individual to individual, but there are generally times during the day where Dr. Milestone may or may not mandate wearing it. Dr. Milestone stresses that the removable retainer schedule can lead to forgetfulness. However, if you don’t remember to wear the retainer, you won’t be benefiting from it completely. Permanent retainers are more effective than removable retainer, and are a great option for patients who don’t want the extra responsibility of a retainer schedules. The only thing you should be mindful of with a permanent retainer is that it may be more difficult to floss, but Dr. Milestone can help show you how to quickly and effectively do so. 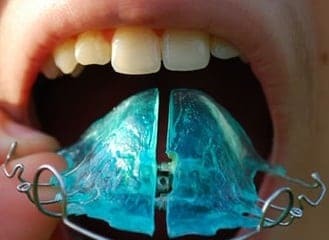 Both may be recommend in some cases with a permanent retainer on the bottom and removable one on top. Whatever the case may be, be sure to follow Dr. Milestone’s advice when using and caring for a retainer. When Milestone Orthodontics removes your braces, Dr. Milestone will use pliers to remove all the brackets, thoroughly scrape and clean all the glue off your teeth, and take a mold for your new retainer. You will feel a little pressure when the braces are being removed, but no pain. Noteworthy, the newly exposed enamel and your gums will be sensitive at first so Dr. Milestone encourages you to stick to your braces-friendly diet for a little while longer. Just like your braces in the beginning, it will take some time to get use to your retainer, and it may be difficult to speak normally at first. Dr. Milestone recommends practicing speaking, reading aloud or singing as much as you can. If you have any questions or concerns, please don’t hesitate to contact Milestone Orthodontics at 973-325-1777.